When visiting Ohio's newest scenic river, the Mohican, take a little time to find Landoll's Mohican Castle. Decide to spend the night and you'll be treated like royalty without all the publicity. This secluded medieval-style castle also boasts a fine dining restaurant. The estate features 30 miles of trails, pool and fitness center. Landoll's Mohican Castle is a towered, gabbled wood and stone monument. The castle is the creation of one man, Jim Landoll. Landoll had always been fascinated with castles. He wanted a castle of his own. After selling his publishing business several years ago he built one. 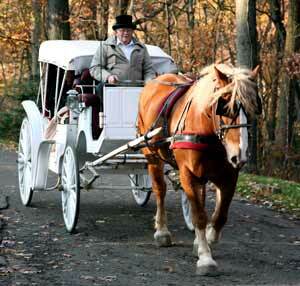 Enjoy the stately majesty of times past in a luxurious castle fit for the kings and queens in all of us. Experience the romance of lazy afternoons, intimate fireside conversation, continental breakfasts and morning walks through private forestland in perfect solitude. Located 1.5 hours northeast of Columbus, deep in the heartland of Mohican Country, the 1,100 acre estate offers unprecedented luxury in its lodging and seclusion. The castle furnishings are far from medieval; rooms boast hand-carved four poster mahogany beds, wrought iron and stone gas fireplaces. 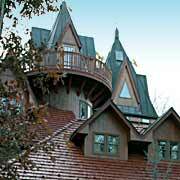 One room in Landoll's Mohican Castle is a 3 level room which includes its own 50 foot tower. 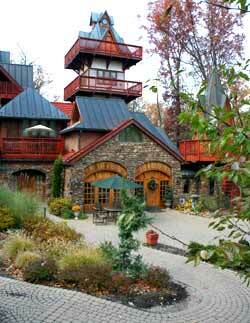 Legends at the Castle Restaurant offers casual dinin for the entire family. The restaurant is open for lunch and dinner, from 11 a.m. to 9 p.m. Friday and Saturday, 11 a.m. to 8 p.m. Monday through Thursday, Sunday Lunch Buffet 11 a.m. to 4:00 p.m., and Sunday Dinner 5 p.m. to 8 p.m. Special Royal Buffets are held on holiday Sundays. The gift shoppe features exquisite, affordable gifts such as hand-painted glassware and other unique gift items. Let us help you with a cup of coffee, chai tea or hot chocolate. Sit by the fire and enjoy. The gift shoppe is open from 10:00 a.m. to 10:00 p.m. Friday and Saturday, and 10:00 a.m. to 9:00 p.m. Sunday through Thursday. The Castle’s Event Center is optimal for conferences, wedding receptions, banquets and parties for up to 250 guests. Large floor-to-ceiling windows bring the outdoors in. A cathedral ceiling, dance floor, kitchen, and a large outdoor patio allow you to create your perfect event any time of year.